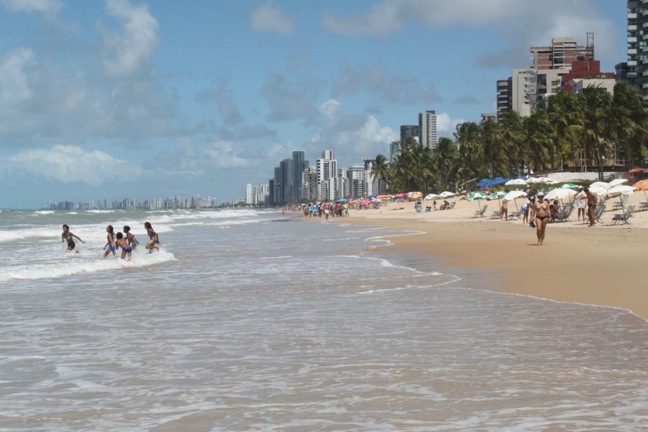 Perhaps the most popular tourist destination in Recife, Brazil is the beach in Boa Viagem. Known for having one of the most visited “urban beaches” in northeastern Brazil, there are miles of sand and ocean on one side and skyscrapers as far as the eye can see on the other. The upkeep along Avenida Boa Viagem is considerably better than the rest of Recife with well-kept, clean sidewalks and small kiosks dotted up and down offering drinks and snacks. The many caution signs warning of shark danger do not deter many from enjoying the cool waters, especially in areas where reefs form natural pools and protection from unwanted sea creatures. The best thing about this beach is that anything you may ever need, want or imagine can be found on its shores. Lay your towel on the sand or rent rent chairs from a vendor. After you’re settled, sit back and relax as an array of treats are continuously paraded in front of you. Sunscreen, sunglasses, beach toys, dresses and even bikinis are sold by vendors. Very rarely are they pesky. A simple shake of the head and “não obrigado” sends them on their way. The sun is making your parched? No worries. You can buy coconut water, mixed adult beverages, beer and soda without leaving your spot and all at reasonably – if not ridiculously cheap – prices. For instance, fresh coconut water is R2.50 – that’s $1.25! It doesn’t get any fresher than this! 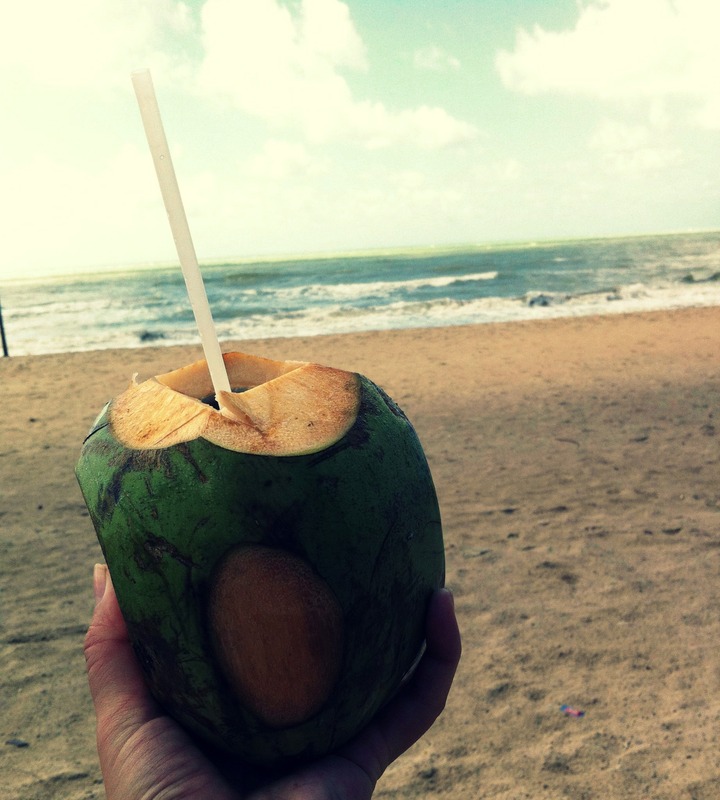 Enjoying coconut water at the beach in Recife, Brazil. 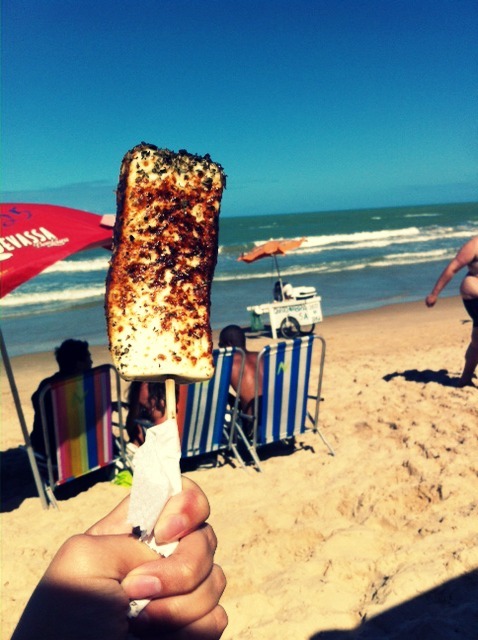 The best items offered on the beach have got to be the food. You can choose a fresh fish from one of the many beach vendors. Once you’ve chosen a winner, they’ll fry it and bring to you – usually accompanied with potatoes and salad. Carts continuously move past you offering queijo na brasa (grilled cheese) with either honey or oregano, boiled shrimp, oysters, caldinho ( black bean soup with different meats), cashews, boiled peanuts, and the list goes on. The biggest effort you need to make for a beach day here is where to place your beach bag. After that, just sit back and relax. Everything is taken care of. Boiled shrimp on the beach.